I’ve had some questions come in lately regarding the use of the “Block editing” function in the Bill of materials setup (Inventory management | Setup | Inventory and warehouse management parameters). This is a useful tool, that allows a little more control of approved BOM’s. 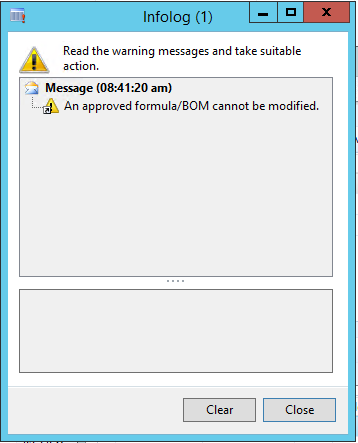 However, it can be kind of frustrating for the approver, when they try and go in to remove the approval and yet still get an error that editing of an approved BOM is not allowed. Select the product you want to work with. Click on Approve to remove the approval. That BOM is where the actual approval lies. In order to get past that error and make changes, you need to remove the approval from the header form that’s linked here. Two ways you can do this. The first is to simply just right-click and View details on the BOM version line you’re trying to edit. This will bring up the Bill of materials form, where you can see that your “unapproved” version is still an “approved” BOM. Remove the approval from this form, make your changes in the BOM line form, and when you approve it again in that BOM line form, it’ll automatically put the approval back on the Bill of materials form. The second way, and the direct route, to get to this form is by going to Inventory management | Common | Bills of materials. However, from here you’ll have to locate and find your BOM manually to make the approval changes. Following these steps will allow you to take advantage of the “Block editing” feature of Bills of materials and still enable your floor managers to make any changes to the BOM’s that they require.